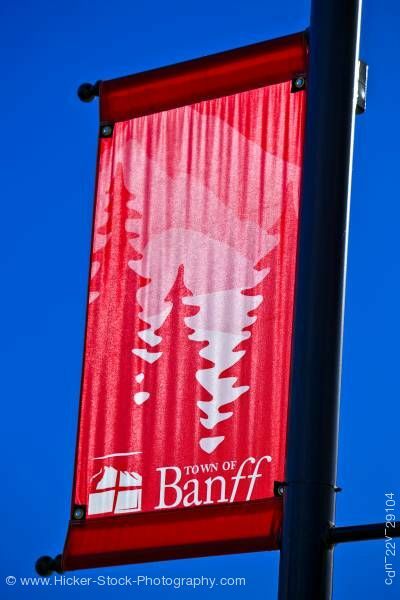 Stock of red banner showing trees and mountains on a black post for Banff Avenue in white letters with an all blue sky background. This stock photo shows a bright red banner displaying trees and a mountain scene along with Banff Avenue in white letters. The banner is on a black post with a bright blue clear sky in the background. Banff Avenue is in the town of Banff. Banff is the largest town in the Banff National Park. The town of Banff has the highest elevation in Canada. It is also surrounded by Mount Rundle, Sulphur Mountain, Mount Norquay, and Cascade Mountain. This resort town is known for it's hot springs along with many outdoor sports such as hiking, skiing and biking. Red sign along Banff Avenue backdropped by a blue sky, town of Banff, Banff National Park, Canadian Rocky Mountains, Alberta, Canada. Banff National Park forms part of the Canadian Rocky Mountain Parks UNESCO World Heritage Site.